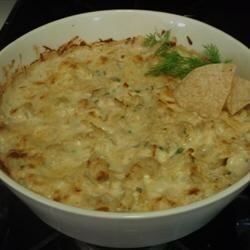 "Here's an easy, lower-fat version of warm artichoke-cheese dip. In new research, artichoke hearts tested surprisingly high in antioxidant activity -- even more per cup than strawberries. Garlic and chives are high in antioxidants, too, and fat-free cottage cheese helps keep the fat and calorie counts down." Really really good especially with the dill flavor. I substituted the artichokes for 'spicy' artichokes - a little added kick. This dip was a huge success at our Sunday football get-together! In my opinion, it was better than the full fat version found in restaurants! We really liked the idea of this dip and we loved the goat's cheese factor, but for us the texture and consistency weren't right.